Please note Valentine's Day Comedy at The Port occurred in past. 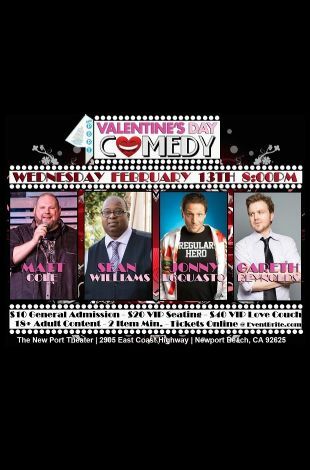 (Pre) Valentine's Day Comedy at the Port! 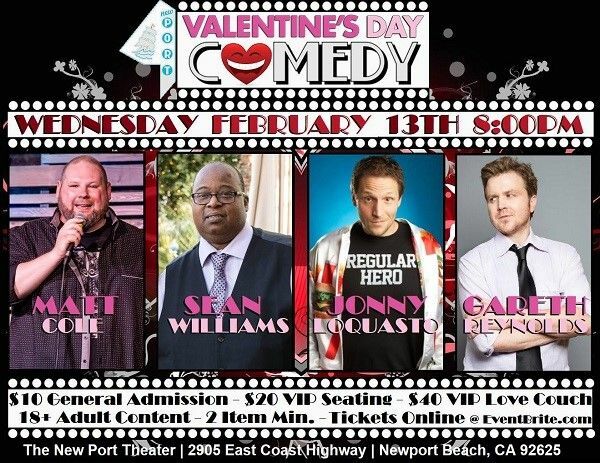 Join us Wednesday February 13th for a hilarious night of Live Stand Up Comedy at The New Port Theater (Doors open 7:00pm - Showtime 8:00pm) 18+ Adult Content - 2 Item Minimum required. We have hand picked some of the BEST comedians in the LA/OC area for this event that will have you Laughing Non-Stop during the 90 minute show. Couple that with The New Port Theater's Menu and FULL Service Bar, featuring great selection of Entrees, Spirits, Beer and Wine for the PERFECT Valentine's Date Night! GARETH REYNOLDS is an internationally touring Stand-up Comedian whose brilliantly clever quips perfectly offset Dave Anthony's hilarious snark on their smash-hit podcast THE DOLLOP which garners over 5 Million downloads every month. Gareth is currently writing on ARRESTED DEVELOPMENT, previous to that he wrote on COMEDY CENTRAL sitcom IDIOTSITTER and NETFLIX original series FLAKED, took the lead on ABC show HAIL MARY and has been seen on IFC's MARON.